a reliable private car hire company and with licensed tour guides for lake Como and can take care of your arranging your trip. Otherwise you can contact this reliable company that Lake Maggiore Stresa Tours can suggest you: BlueTaxi by Davide Ferri, a professional and licensed driver chauffeur. From 1 to 8 passengers sitting in a comfortable vehicle / minivan. They operate on lake Maggiore, Stresa, Orta San Giulio and lake Orta, lake Como and Milan driving you wherever you need! English-speaking driver! For many travellers coming to the Italian lakes, a classic itinerary is the one which combines a stay in Stresa on lake Maggiore with a stay in Bellagio on lake Como. When looking at a map, these two towns may seem very close one to another but there is a two-hour drive between them. Moving from Stresa to Bellagio or from lake Como to lake Maggiore may also not be that easy as there are no direct public transport links. 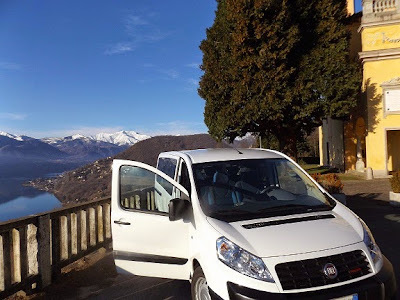 So unless you wish to spend a day getting on and off trains, buses or boats, waiting for connections, maybe getting stressed and tired, the best solution is hiring a private car hire that can be booked in advance whether you are staying in Stresa or in Bellagio. Of course that will not be as cheap as public transportation but if you do not want to get stressed and want to ensure that everything runs smoothly this makes everything easier! A private taxi driver will pick you up directly at your hotel and will assure you a stress-free and comfortable journey in the minimum time required. You are on holiday, aren't you?